ALCO (American Locomotive Company): Originally formed as a steam locomotive manufacturer from several small builders, ALCO diversified into diesel power relatively early, but was plagued till its end by a (not always deserved) reputation of unreliability (though the Reading faired well with their seizable fleet of RS-3’s). Always a distant second to EMD and later GE, ALCO exited the domestic locomotive market in 1969, selling its locomotive designs to Canadian subsidiary, Montreal Locomotive Works (MLW). MLW continued to produce locomotives for the Canadian and export markets for several years and in 1975 was acquired by Bombardier, which ceased production of diesel locomotives in 1985. American: a steam locomotive with a 4-4-0 wheel arrangement, 4 pony truck wheels up front, 4 driving wheels in the middle and no trailing truck wheels at the rear. Anthracite Coal: the highest rank coal. Very rare, found primarily in northeastern Pennsylvania. Known for its clean burning and smokeless characteristics. 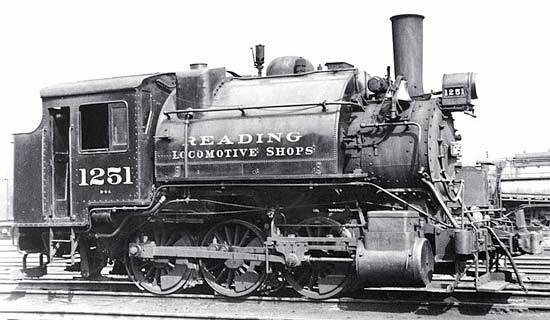 The demand for anthracite and the ability to transport it more efficiently by rail than by canal/barge was the chief reason the Philadelphia & Reading Railroad (predecessor of the Reading Co.) was chartered in 1833. Atlantic: a steam locomotive with a 4-4-2 wheel arrangement, 4 pony truck wheels up front, 4 driving wheels in the middle and two trailing truck wheels at the rear. Baldwin Locomotive Works: at one time the largest maker of heavy machinery in America and an important global exporter, the Baldwin Locomotive Works of Philadelphia achieved renown as one of the nation’s most successful and important firms. Relying on gifted designers and skilled craftsmen, Baldwin built thousands of standard and custom steam locomotives, ranging from narrow gauge 0-4-0 industrial engines to huge mallet compounds. (caption info courtesy The Baldwin Locomotive Works, 18311915: A Study in American Industrial Practice by John K. Brown). Breaker: an often large building located close to a mine shaft, housing machinery to break-up large pieces of mined coal into different sizes and grades of coal (from small to large: rice, buckwheat, pea, chestnut, stove, egg and grate) and remove impurities. The sorting of these different kinds of coal is done by a system of screens which lie in tiers. Each succeeding screen projects farther out than the one next above it. The finest coal falls into the first row of bunkers, the next in order falls into the next row of bunkers, and so on. The finished product is then loaded onto hopper cars for delivery (click here for a schematic). Camelback (or Mother Hubbard): A steam locomotive with the cab astride the boiler. The fireman is located at the traditional position behind the rear of the engine with a small overhead hood for protection (click here for a photo of a Reading class A-4b Camelback). Consolidation: a steam locomotive with a 2-8-0 wheel arrangement, 2 pony truck wheels up front, 8 driving wheels in the middle and no trailing truck wheels at the rear under the firebox (click here for a photo of a Reading class I-10sa Consolidation). CRR of NJ: Central Railroad of New Jersey. Crusader: named through a contest, styled by Paul Crett and manufactured by the Budd Co., the Crusader was Reading’s premier passenger train that featured an observation car at each end and a diner car in the center of its consist. Hauled initially by a streamlined Pacific and later by FP7’s, the Crusader made a twice daily trip between Philadelphia and Jersey City for 13 years (click here for an early steam-powered photo of the Crusader). EMD (Electro-Motive Division of General Motors): founded in 1922 as the Electro-Motive Engineering Company (later changed to EMC), a gasoline-powered rail motor car builder. It was purchased in 1930 by General Motors and began building multi-car diesel streamliners. In 1939 it produced the FT, a multi-unit freight locomotive that would ultimately help seal the fate of the steam engine. In 1941 GM merged EMC with Winton Engine to create the Electro-Motive Division (EMD). It went on to produce some legendary and highly successful freight/passenger locomotives such as the SW, F, E, GP and SD series. EMD continues to build and service diesel-electric locomotives for commercial railroad use, including commuter, freight, industrial, intercity passenger, and mining. GE (General Electric): in 1940, GE and the American Locomotive Company (ALCO) entered into a partnership to build diesels under the name ALCO-GE. GE supplied the electrical gear for all diesel locomotives produced by ALCO. By 1948, ALCO-GE possessed 40% of the diesel locomotive market with the RS, FA and PA series locomotives. At some point, GE became dissatisfied with its arrangement with ALCO and entered the domestic road diesel locomotive market itself in 1956. Today, GE is the number one locomotive builder in North America, followed by EMD. Hall “Banjo” Disk Signal: invented by Thomas Hall in 1869, this distinctive signal which was used by the Reading, permitted a single light source to display three different colors and was manufactured by the Hall Signal Company through 1925 (click here for a photo). Interlocking Tower: a towerlike structure or building housing the control equipment for an arrangement of signal apparatus and switches. Once a critical part of the railroad infrastructure, they have become increasingly obsolete due to computer and telecommunications technology advances. As of 2007, there are less than 120 active interlocking towers in North America. Ironton Railroad: was an 8-mile long shortline near Allentown, PA, that was leased jointly by the Reading and the Lehigh Valley Railroad. Its equipment was usually supplied by the Reading. LV (Lehigh Valley Railroad): originally founded in 1846 as the Delaware, Lehigh, Schuylkill & Susquehanna Railroad Company, it changed its name to Lehigh Valley (LV) in 1853. The LV’s growth was based on hauling coal from the anthracite mines of northeastern Pennsylvania. It acquired other small lines in Pennsylvania and New Jersey until it reached New York City in the east, Buffalo in the west and on up to Finger Lakes in New York and terminating on the shores of Lake Erie. The LV eventually suffered the same fate of the Reading as coal traffic began to decline after WWII. By 1962, the Pennsylvania Railroad (also experiencing decling fortunes) acquired majority stock control of the LV. In the coming years, the Pennsylvania Railroad would merge with the New York Central to form the ill-fated Penn-Central (PC). The PC declared bankruptcy in 1970, taking down other railroads with it including the LV and the Central Railroad of New Jersey. Eventually in 1976, both railroads along with the Reading, Penn Central, Ann Arbor Railroad, Erie Lackawanna Railway and Lehigh & Hudson River Railway would be folded into the government owned Conrail. Mallet: designed by the locomotive engineer and inventor Anatole Mallet (1837-1919), a Mallet type locomotive is a four cylinder compound articulated locomotive. Mallet locomotives have essentially two steam engines mounted under the same boiler. The rear engine is rigidly attached to the boiler, while the front engine is able to swing laterally around a pivot point located near the rear, high-pressure cylinders This articulation allows the locomotives to negotiate curves that would not accommodate a large rigid-frame locomotive (click here for a photo of a Reading class N-1sb Mallet). Mikado: a steam locomotive with a 2-8-2 wheel arrangement, 2 pony truck wheels up front, 8 driving wheels in the middle and 2 trailing truck wheels at the rear under the firebox (click here for a photo of a Reading class M-1sa Mikado). Northeastern Caboose: a center cupola caboose originally based on a USRA wood-sheathed design that was later modified by the Reading into an all-steel version. Most closely associated with the Reading as its “standard” caboose, other northeast railroads such as: CRR of NJ, LV, Lehigh & New England, Western Maryland also adopted this design. Built over a 25 year period starting in 1924, many of these cabooses fortunately still survive to this day. The Society currently has 3 cabooses of this type in its collection. Northern: a steam locomotive with a 4-8-4 wheel arrangement, 4 pony truck wheels up front, 8 driving wheels in the middle and 4 trailing truck wheels at the rear under the firebox (click here to see more info on the Reading T-1 Northerns). Pacific: a steam locomotive with a 4-6-2 wheel arrangement, 4 pony truck wheels up front, 6 driving wheels in the middle and 2 trailing truck wheels at the rear under the firebox (click here for a photo of a Reading class G-3 Pacific). PennsylvaniaReading Seashore Lines: created in 1933 through the merger of Reading Co. and Pennsylvania Railroad trackage in southern New Jersey that served many of the shore points including: Atlantic City, Ocean City, Wildwood and Cape May. The Camden to Atlantic section is currently owned/operated by NJ Transit while a short section between Cape May Court House and Cape May City has been restored to operation by the Cape May Seashore Lines. Rail Diesel Car (RDC): a self-propelled passenger car with 2 diesel engines located beneath the car floor built by the Budd Company of Philadelphia, PA in the late 1950s and early 1960s. RDC’s were offered as a cost-effective way for railroads to compete in the passenger business at time when market share was rapidly being lost to automobiles and airplanes. RCT&HS currently has two RDC’s in its collection, Nos. 9152 & 9162. Reading Terminal: originally opened in 1893, the Reading Terminal at 12th and Market Streets, was at one time, a major gateway to the city of Philadelphia, served by hundreds of trains each day. From there, one could go not only to suburban locations like Jenkintown and Ambler but also to New York, Bethlehem, and Toronto. In the early Twentieth Century, a train left here every hour for New York City. Formally closed as a rail passenger facility in 1984, the station reopened in 1994 as the Pennsylvania Convention Center (click here for a photo). Saddletank (or Side Tank): a steam engine that lacks a tender, carries water on tanks straddling the boiler and fuel in a small bunker directly behind the cab. Saddletankers were often used by railroads to work in areas where space and clearance were at a premium such as: mines, lumber mills, manufacturing plants, construction sites and engine terminals. The only lucky Reading survivor of this type, #1251, is currently on display at the Railroad Museum of Pennsylvania. Taylor Trucks: a type of truck (wheelset) that was unique to the Reading and used on its Northeastern Caboose. T-1: a Northern-type steam engine constructed in the late 1940s using components from class I-10sa Consolidations (click here for more info on the Reading T-1 Northerns). Wootten Firebox: a wide firebox that was characteristic of all Reading steam locomotives, designed by Reading Superintendent of Motive Power, John E. Wootten to burn culm (cheap, low-grade coal leftover from the preparation/sorting process of anthracite coal). The extra grate area afforded by the larger firebox was necessary because of anthracite’s high ignition temperature and its tendencey to form clinker, the waste product of burning coal with high-impurity/ash levels.